It’s cruelty befitting a Greek tragedy. Three years pass, the daughter, now an outspoken hero to countless others who have lost loved ones at the hands of police brutality, is a high-profile face for an insistent new police reform movement called Black Lives Matter. Then, in a twist of fate that mirrors her martyred father’s horrifying demise, the daughter herself is felled by a heart attack brought on by a breath-depriving asthma attack. As if to compound her family’s seemingly endless suffering, the daughter dies during the holidays, Christianity’s celebrated season of miracles, wherein the faithful are offered a path to redemption. 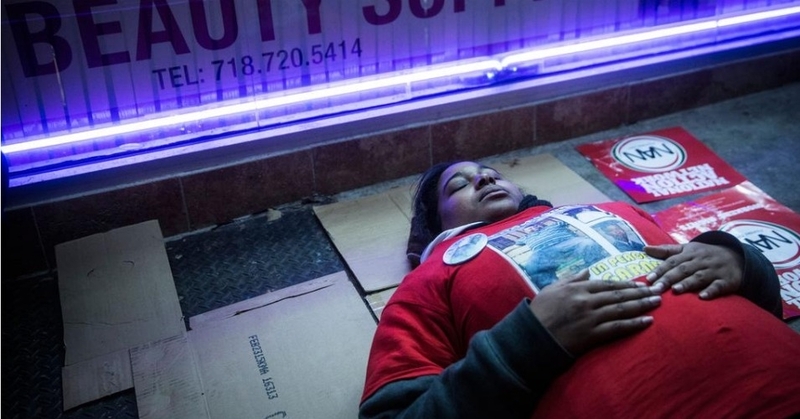 That is the heart-shattering story of Erica Garner. In 2014, the then-23-year-old was thrust into the global spotlight when her father Eric Garner died from an illegal choke hold after resisting arrest by New York police. Eric Garner’s videotaped dying words; “I can’t breathe” became a rallying cry for the anti-police brutality movement, helping to fuel the Black Lives Matter crusade for police reform. That 2014 choke hold reopened a wound in the African-American community, one that is not God-given, but rather inflicted by law officers who vow to “serve and protect.” In his 2013 book, The Cross and the Lynching Tree, theologian James H. Cone writes: “In the ‘lynching era’… white Christians lynched nearly five thousand black men and women in a manner with obvious echoes of the Roman crucifixion of Jesus. Yet these ‘Christians’ did not see the irony or contradiction in their actions.” Indeed, as Eric Garner’s death proves, there is a crooked and disingenuous through-line between the Crucifixion and the kangaroo-court justice visited upon blacks since the Jim Crow era. Eric Garner’s death, along with those of many other blacks killed in fatal police encounters, was a chilling reminder that state-sanctioned executions are still a frightening component of African-American life. Nor, it seems, did destiny give Erica a fair shake. The world had a scant three years to know Erica, yet she shined brightly during her short time on the international stage. Her father’s death was such a cause célèbre that many people would have excused her for simply expressing inchoate rage over her dad’s mistreatment at the hands of police. Yet instead of being consumed by anger, Erica became of an insistent voice of reason during one of the most racially sensitive periods in America’s modern history. Erica was applying increasing pressure on one of the world’s most assertive law enforcement agencies, the New York City Police Department, which has been consistently dogged by accusations of institutional racism. Evidence has revealed that blacks and Hispanics make up most of the citizens stopped for street interrogations allowed under the department’s stop-and-frisk policies. Since the 1980s, the department has made international headlines for fatal encounters involving blacks, including Eleanor Bumpers, Amadou Diallo, Sean Bell, and countless more. In 2004, the department acknowledged the existence of an intelligence unit designed to perform surveillance on rappers and others involved in the city’s hip-hop scene. This is the police organization Erica fearlessly challenged during her stint as an activist. Erica’s cause was taken up by pro athletes, including NBA stars LeBron James, Kobe Bryant, Kyrie Irving and more. Eric Garner’s dying sighs of “I can’t breathe” became a galvanizing slogan for the Black Lives Matter movement. Before long, Erica was fielding interview requests and speaking invitations from schools, colleges, churches and social justice organizations. She made television appearances, both nationally and in her native New York. After a grand jury declined to indict the officer involved, the Garner family brought a wrongful-death lawsuit against New York City, winning a $5.9 million settlement. While Erica may have been soft-spoken, she was fiercely independent. When many blacks threw their support behind Hillary Clinton’s 2016 presidential campaign, Erica raised eyebrows for backing Bernie Sanders, citing the Vermont senator’s long-standing civil rights record. At the time of her death, she was in the process of starting a nonprofit to identify and endorse candidates sympathetic to the cause of police reform. Like Rodney King — himself a police brutality victim who pleaded for peace amid the havoc of the 1992 Los Angeles riots — Erica never sought to become a civil rights lightning rod. She occasionally let her frustration slip, like in 2017 when she voiced her exasperation with the Department of Justice. (“The DOJ literally gathered my family in one place,” she tweeted, “after we have been waiting for answers for 3 years to say they cant answer S—!”). By all appearances, Erica was catapulted into activism by her father’s death, and was carried along by her own grit and a sense of purpose. “I had no idea what I was doing, but I connected with the right people and went from there,” she said. By and large, Erica wore the mantle she assumed with powerful restraint. Now, the pain many of us felt after viewing her father’s protest-prompting death is magnified by Erica’s own passing. The hurt we experienced after her dad’s killer was let off the hook is now magnified by the knowledge that Erica’s two kids will grow up without their mother. The daughter who tirelessly sought justice for her slain father has gone to join him in the afterlife, all too soon.